Oroginally, this print was designed by Utamaro and published in the late 1790s. Yours is a 20th century reproduction, where the censor's seal of the original (kiwame) has been replaced by the publisher's seal of Hasegawa, and the original publisher's mark of Tsuruya Kinsuke omitted altogether. 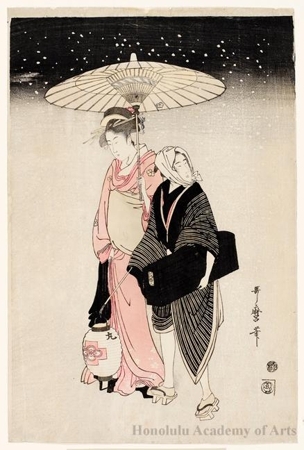 The print has no title, but it depicts a geisha and her male attendant walking through the snow at night.